Finnish horde Archgoat was formed at the end of the eighties, and after the recording of some demo tapes, they wrote some new material that was supposed to be released via Necropolis Records (which, at that time, was one of the most impressive underground labels, I think), along with some older stuff that appeared on the demonstrational recordings. Normally it would come out in 1993, but because of some specific circumstances, the release got postponed. Eventually the material was made available at the end of last century on CD, as part of the split with another legendary act from the Land of a Thousand Lakes, the barbaric combo Beherit. Some of the material from that recording session, FYI, came out in 2005 on vinyl via Hammer Of Hate Records, and some of this stuff was re-released too, in mean time, on a split with Surrender Of Divinity. Anyway, after the recording of that first LP (which was called Angelcunt, by the way), the band split up. About ten years ago, however, Archgoat reformed. New stuff was written and recorded (cf. a couple of albums and EP-material, besides old material that got compiled or re-released), and the band played live all over Europe and North-America, and eventually also in South America and Australia. And this brings me to this next chapter within the band’s history, a collection of new tracks gathered under the working title The Apocalyptic Triumphator. The material was recorded in October 2014 in the Temple Of Black Moon studio with e.g. Lauri ‘Satanic Tyrant Werewolf’ Penttilä (you know, the guy behind sweet acts such as Satanic Warmaster, Horna, Armour, Blasphemous Evil, The True Werwolf etc.) behind the helm. 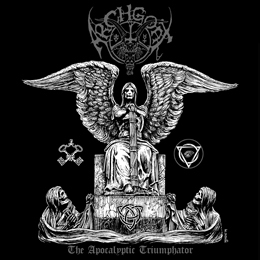 It lasts for just over forty minutes and was recorded by original members Angelslayer and Ritual Butcherer, and Sinisterror, who joined shortly after Archgoat’s resurrection. After the short, somewhat ‘evident’ intro (Left Hand Path), the trio proves to be at least as mean, angry and f*cked up as they did twenty five years ago. What this trio brings is an enormously occult and nihilistic, down-tuned, minimalistic, morbid, brutal and sinister mixture of Blackened Death Metal and Deathened Black Metal, including elements from Doom, Doom-Death, Morbid Death, Grinding Death, Thrashing Death and Deadly Thrashing Doom Black Grindcore Metal stuff… thing… alike… stuff… Anyway, you might get the (ugly) picture, I guess. Blasphemy and disgust go hand in hand in a most sweet marriage (divorce not guaranteed, luckily), with a focus on purity, tradition, nihilism and an elementary no-nonsense attitude. Yeah, for sure this stuff could have been released via the likes of Hells Headbangers, Iron Bonehead, Invictus, High Roller or Hammer Of Hate, amongst some brave others. But don’t f*cking expect something that renews the scene, because you won’t get this enjoyment. Nor will you receive originality, creativity or modernity. …in case you might search for those elements. Damn no, what The Apocalyptic Triumphator stands for is sonic nastiness we did hear before, many times. I do not mind, for this band is one of those acts that did give an identity to this scene, but at the other hand one needs to be serious, and as a (honest?) reviewer I need to warn you in order to preserve you from brainlessness. Damn yes, a couple of times it sounds so pathetically predictable or infantile (cf. Grand Luciferian Theophany) that one might lose his / her belief. Yet then again, the essence, the core of this whole experience, contains so much details, which must make the die-hard ‘fans’ sort of aroused. Simplicity and purity prevail on the lack of creativity, I guess, and that’s a compliment.